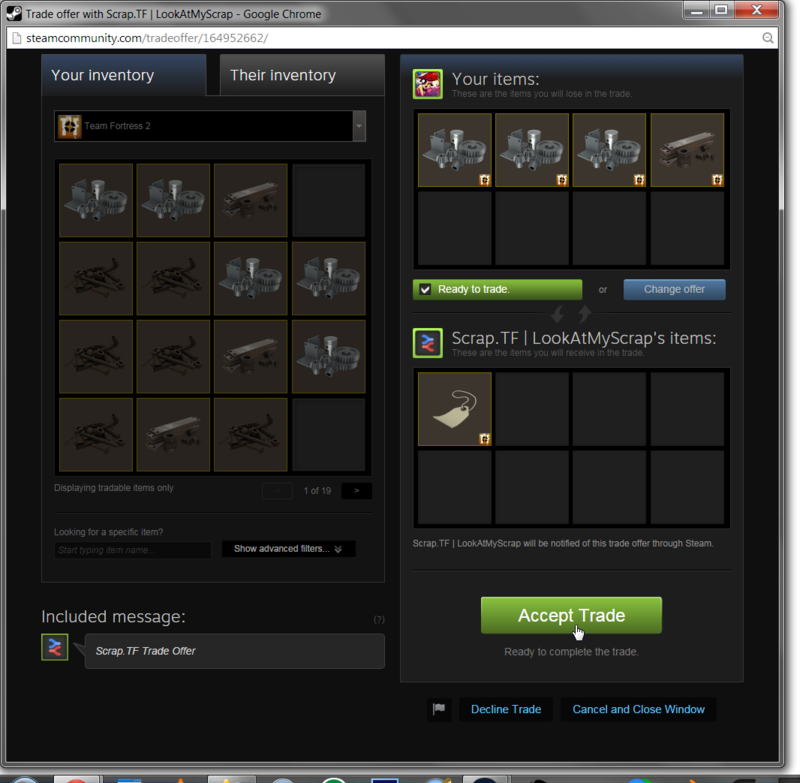 Everything about trading valuable items and high-value Stranges. 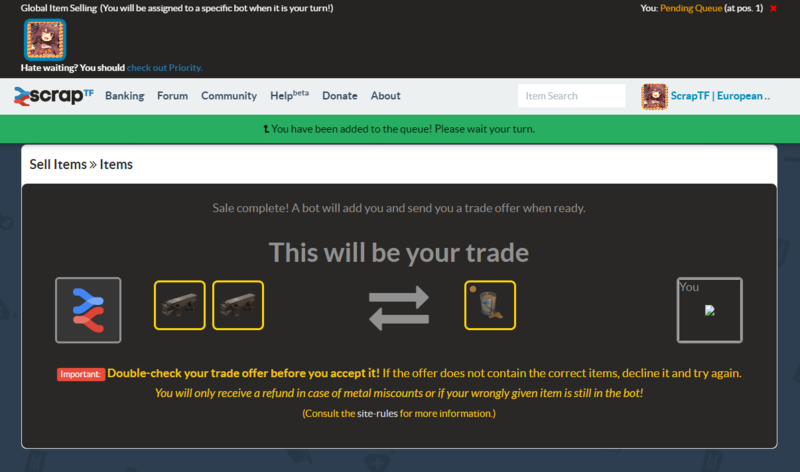 Guide: How do I sell my items to the item bots? I want to sell items for metal / keys, how do I turn my items into metal / keys? This is the items page. Click on the "Sell Items" button to begin. Here you choose the items you want to sell. I've selected a Muskelmannbraun paint. To the left you can filter your items if you for example only want to see your Scout or Heavy items. To the right you'll see how much you'll get for your items. You're now in the queue to sell your items. You can see the queue at the top of the screen. I'm currently in a "global queue" which is what you'll be in at the start. Then you'll be assigned to a bot to trade with it. You might be in a queue for a minute or so. You can see what the trade needs to look like. 2 reclaimed metal for my Muskelmannbraun paint. 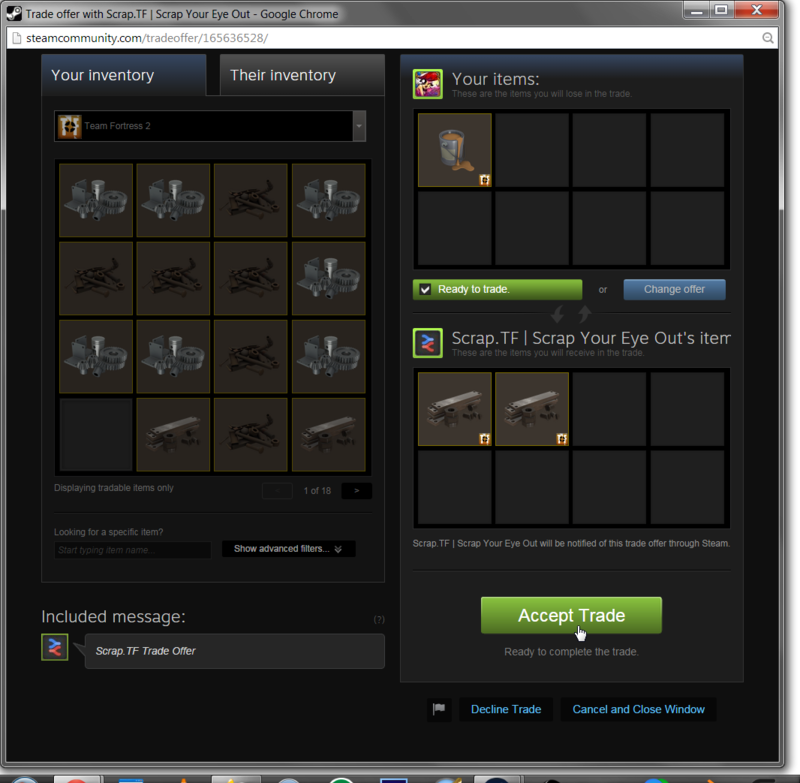 You've now succesfully completed a Items trade! Congratulations! Guide: How do I buy items from the item bots? I want to buy items from the item bots for metal and keys, how do I buy these? This is the items page. Scroll down a little and you'll see all the bots. This is a bot. Click on it to see all the items it has. Now you'll see your backpack. Here you can choose if you want to trade your items for the items you selected before. I want to pay with metal and or keys so I don't select anything and hit the "Trade Now!" button. You're now in the queue to buy the items you selected. You might be in a queue for a minute or so. You'll now see this. You now have the items you wanted. Simply close it by clicking the white X at the top right of the box. The item that I want to sell does not show up! Your backpack might be outdated, try closing TF2 if you have it open or try restarting Steam. The item you are trying to sell is not on the price list. Scroll down on the item banking page to see it. If the item is uncraftable, make sure to check the chart to see if we accept the not craftable version of it. We have hit the stock limit of said item. You can see the limits in the price list.